think this is a great idea from Goodyear tyres. This was a great gesture by the Goodyear rubber company. Thus, to honour the troops. By adding support the troops on Goodyear Tyres sidewall. Of course, that took part in Indy race series. Hi I would like to introduce myself. I have worked in the Garage and tyre and Battery business now for 40 years. As a result, I worked for a couple of national tyre companies . Before starting my first business. Consequently, I now own a company here in the UK. Locally known as Pellon Tyre and Auto-centre .Blogging about anything to do with cars and their related products. hence, that will help my business. 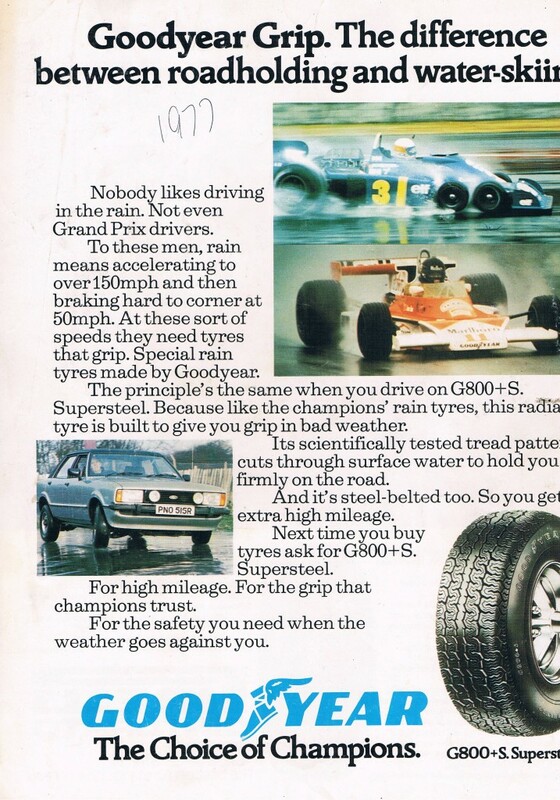 It is truly good to see the top tyre companies such as Goodyear . Hence, testing their products before release to the public domain. Including, also during real time, as with these guys and their VW Golf GTi. Therefore, it is always a good thing to have an opinion about a product. Thus, that you know will work when it comes to buying parts for your car. Consequently, I can remember with fond memory. Of course, for the test track days that Goodyear held in Luxembourg. As a result, I have spent many happy days with other tyre company owners. Testing various Goodyear products. Including The new “excellence tyre” by Goodyear. Which is also a great tyre for the driver to think about when it comes to the time that you need your cars tyres replacing. subsidiary in the early seventies and Goodyear really were one of the top tyre brands and supported many motor sport events, especially rallying. The company manufactured high quality rally car ones that were used by the top rally drivers of the time. To get more up to date they are now producing excellent performance and are used on cars like the great looking VW Golf in the picture. Many tyre companies have special relationships with car makers to have their tyres fitted such as the Goodyear Golf GTi Tyres deal that has been recently struck. Pellon Tyre and Autocentre offer car and van servicing and repairs to all makes of vehicles. We are members of Unipart Car Care centres and give a Nationwide guarantee for all our work and parts. Time for new rubber. I want tires made in the U.S. My Michelins have cracked side walls so I won’t be getting those. Looking at Goodyear Wrangler or. So, in my experience the Michelin tyres were very likely to eventually crack open in the bead area. Because they last longer than most other tyres then they become more exposed to the sun. Thus causing them to develop surface cracking. Subsequently, these Michelin tyres are over six years old. Of course in any case then this is the time limit when you should replace them. Of course, no matter how much tread the that you have left. Naturally, the suns rays will cause the tyres to crack. Due to the reaction with the carbon black. Hence, one of the key substances that is in the compound that makes the tyres. However I think that the Goodyear Wrangler is a good choice of tyre for the off road vehicles. Update Goodyear NASCAR tyres create a different problem. Goodyear tyres have been behaving strangely for the NASCAR drivers. Especially in the hot weather races. Goodyear’s have been acting normal during normal driving from the start. Giving excellent grip as normal ! But has the day begins to heat up the tyres start to loose their grip. On the other hand though the tyres are expected to grip much better in the night time part of the racing. This to me is just normal compound development and you just cannot have the same gripping in hot conditions as you do in cooler conditions, like the night time part of the race, this is all part of why the NASCAR races are so interesting. Goodyear Wrangler a World brand in motorsport,including Off Roading Johnson feels that what lines the drivers choose on restarts will dictate their progress. His Hendrick Motorsports teammate Jeff Gordon, who will share the front row with Brad Keselowski when the Cup cars take the green, also found the combination of the track condition and tyres curious during both practice and qualifying. Pellon Tyre and Auto-centre offer car and van servicing and repairs to all makes of vehicles. Members of Unipart Car Care centres and give a nationwide guarantee for all our work and parts. Also Goodyear tyres online from our website www.pellontyres.co.uk . Using the tyre selector and choosing your tyre size. Offering courtesy cars to local motorists who need to go to work and leave their car with us for work doing. Also an official MOT testing station and are members of Motor-codes. Finally,who carry out checks for high standard of equipment and workmanship. The performance ratings shown on the label of Goodyear’s new touring tyre, from the Goodyear Efficient Grip range, are excellent: A for wet grip and B for rolling resistance (Have you heard about the new #tyre; #Goodyear Efficient Grip performance? We at Pellon tyres here in Halifax sell many Goodyear tyres. Consequently, the Goodyear efficient-grip . Hence, is one of the most popular Goodyear tyres . As a result that we have had the pleasure to fit. Over the years we have fitted many Goodyear tyre products . Going right back to the G8 and the G800+s. Jackie Stewart was a Goodyear tyre tester and a strong advocate of the Goodyear brand. Of course, these tyres were a very important step. Thus, in the development of car tyres . Aiding development for the cars of each period of time. As a result, car designs and mechanical up-grades . Have always had to kept up with by the tyre manufacturers. I remember the Goodyear Grandprix-S . Arriving, when front wheel drive cars were first hitting our roads. Tyre tread design and construction were changing all the time. Hence, to keep with the development of the modern cars. This new Goodyear Efficient Grip is no exception, except this time the emphasis is on much greener and fuel efficient tyres. This new tyre a further development of the Goodyear Efficient Grip will be no different to the tyres produced in the past by this excellent tyre company, Goodyear tyres. For the best fuel efficiency for your car, it is very important that your make sure that your tyres are properly inflated. When you run your car on low tyre pressure it increases the rolling resistance and also has an effect on the wet grip performance. The weight of your car and your personal driving style can also make a big difference, we have all seen the “boy racer”, who flies everywhere at 100 miles an hour. Well little does he know it, but he will be using twice the amount of fuel as the steady driver who probably sticks to the speed limits . The sensible person is said to be more aware of “Energy-efficient driving”, or “Eco-driving” which can significantly bring down your fuel consumption. Goodyear Efficient Grip-What is the reason for a tyre to be more fuel-efficient? To put it simply, a fuel-efficient tyre requires less energy to roll forward. The easier it is for the tyre to roll then it has a lower demand for fuel, since a lesser amount of energy is wasted on friction and heat from the road surface. This is usually referred to as tyres with ‘low rolling resistance’, which means the same thing. How do the fuel efficiency labels show thet tyres rating ? and the Rating of D is not used for passenger cars. Goodyear Efficient Grip-What do these ratings mean? They mean fuel savings for the motorist, the difference between an A rating and a G rating can mean a lowering of fuel consumption by up to 7.5%. To put this in practical terms, buying an A-rated tyre instead of G-rated one could mean that you save more than 6 litres of fuel every 1000 kilometers. And at an average cost of petrol at say £1.50 per liter, you could end up saving yourself more than £300 over the life of the tyres. These figures are on the Goodyear European web site and state that they based on an average cars consumption of 8 liters/100km, at a fuel price of £1.50/liter, and an average tyre mileage of 35,000 km. Consequently, the Geneva Motor Show always comes up with some surprises. Including, the latest new tyre technology. Although, most of the Geneva show mainly interests on new car models. But, at this year’s event. Hence, tyre manufacturers such as Falken and Goodyear have come up with some very interesting new technology. For this reason, Falken came up with two different new types of tyres: one reducing fuel consumption. Of course, and another that’s designed to reduce the noise. Especially, when your car drives over bumpy roads. On the other hand, Goodyear unveiled a futuristic-looking rubber golf ball it thinks will be the future of tyres. Most of the leading tyre companies are striving to add new materials. Thus, in new tyre development. Please see the links below for other innovations.